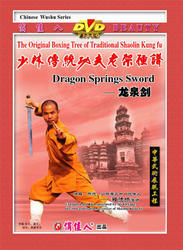 The Dragon Springs Sword is one of the excellent routine in traditional Shaolin wushu. It has long history and its movements are plain and simple, without any specious postures and with strong power. While practicing, it looks very elegant and nice. It requires outside and inside of the body to be coherent, and the thought goes along with the posture. The posture changes with the body moves. You should pay attention to the change of the sword-finger and sword technique, thus you can show the elegance of " sword like a flying phoenix". The posture would be more fluent, bold and unconstrained with hard and soft assisting each other.